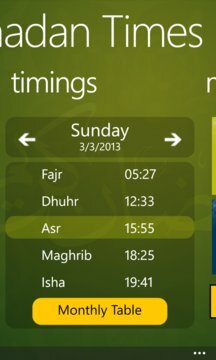 Ramadan Times is the first ever app for all the Muslims around the globe to celebrate the Holy Month with updated timings and notifications. 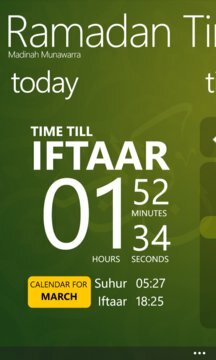 This location-aware app lets you keep a track of Suhoor and Iftaar timings along with the reminder, tiles and lockscreen notificcations. In addition to that, you can also view the Prayer timings with Monthly Calendars of a year based upon your chosen calculation methods and location. You can also read and share the translation of Qur'anic verses, Hadiths and Quotes from famous religious personalities via SMS, Social Networks and Email. What was new in v1.5?